Simply Sync Password allows organizations to synchronize their passwords and active directory properties from their local Active Directory site to an external Active Directory sites or other external systems. 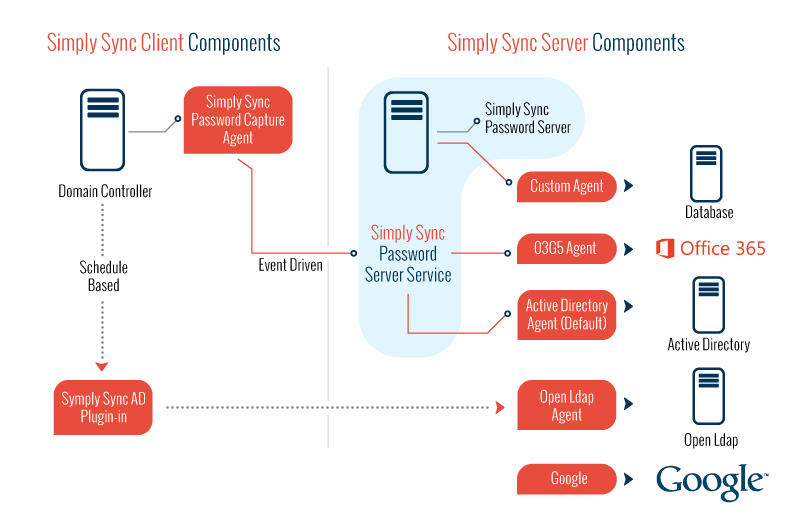 Simply Sync Password is a great alternative for organizations that do not want the added complexity and cost that comes with establishing a trust relationship between Active Directory sites or deploying an AD FS infrastructure. AD FS is great for large organizations, but in many cases it just doesn’t make sense for small and medium size organizations. The new version of Simply Sync Server supports the legacy Simply Sync Clients. The role of the Password Capture Agent is to intercept password changes as they occur on the domain controllers. Since you don’t know which domain controller a user is going to use to reset their password, the Password Capture Agent must be installed on all domain controllers. The Password Capture Agent does not interfere with the password change process, it simply intercepts the change request as it happens. When a user’s password is changed, the client intercepts it, and passes it off to the Password Sync Server. The role of the Password Sync Server is to change the passwords on the target server. 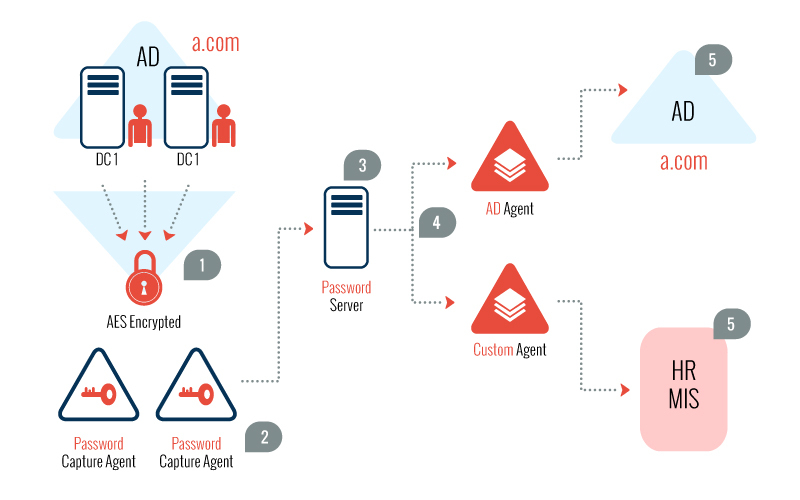 The Password Sync Server is installed on a single server and all Password Capture Agent systems are configured to use the single Password Server. 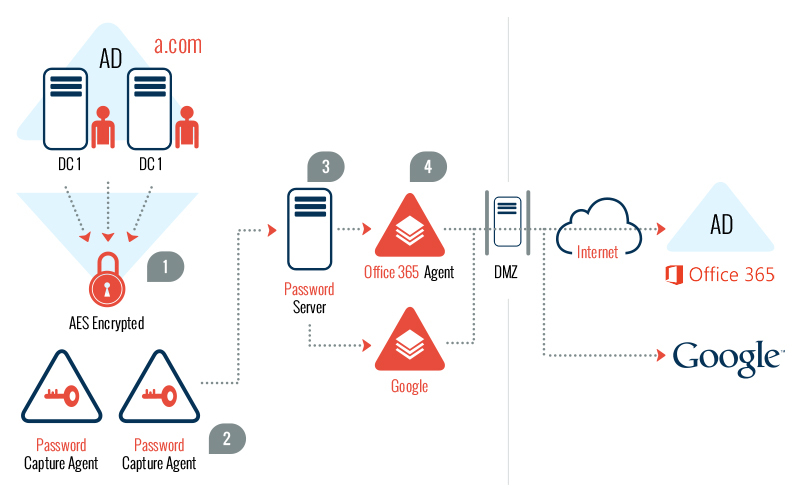 When the Password Capture Agent sends a password change to the Password Sync Server, the Password Sync Server connects to target system and changes the user’s password. The entire process from the user changing their password in Active Directory to the password being changed in target system typically takes less than 30 seconds. The Password Sync Server runs as a web service and can be configured to use customized logic to synchronize multiple target systems. 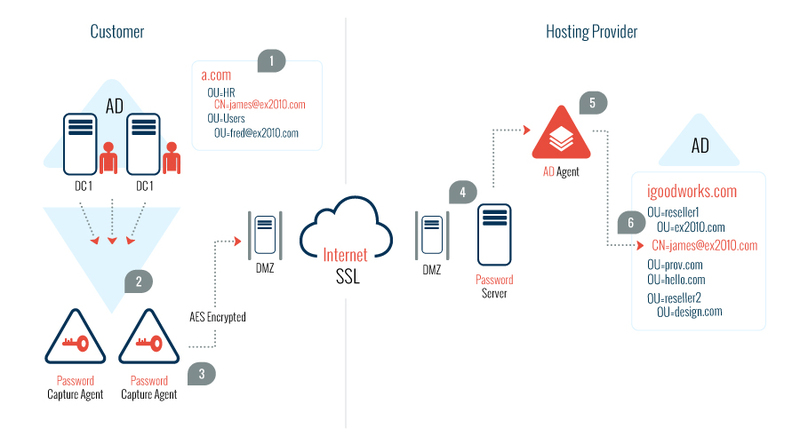 A hosting provider can utilize Password Sync Server to provide their clients a way to sync their Active Directory passwords to a hosted Active Directory site. Its intended target audience is small to medium organizations or hosting providers. The role of the Simply Sync AD Plug-In is to sync users and group active directory properties on the target server. The Simply Sync AD Plug-In is installed in any member server of source domain. The Simply Sync AD Plug-In runs as a backgroup schedule service. 1. Company A merges with Company B. They want to sync A.COM password to B.COM. 2. Company A wants to sync passwords to HR or MIS database. Hosting Provider wants to provide the customer with a way to sync account passwords in their Active Directory to a hosting provider’s Active Directory. 1. 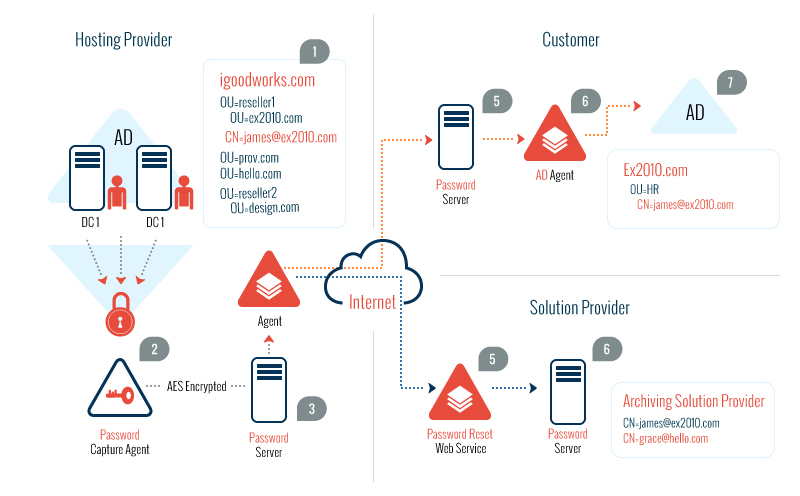 Hosting Provider wants to provide the customer with a way to sync account passwords in the hosting provider’s Active Directory to customer’s Active Directory. 2. Hosting Provider wants to sync password in hosted Active Directory to a partner solution. Simply Password Synch is licensed per Capture Agent, Password Sync Server Installation and the number of user account you plan to support. For Hosting providers volume pricing is available, please contact info@igoodworks.com for all purchase options.